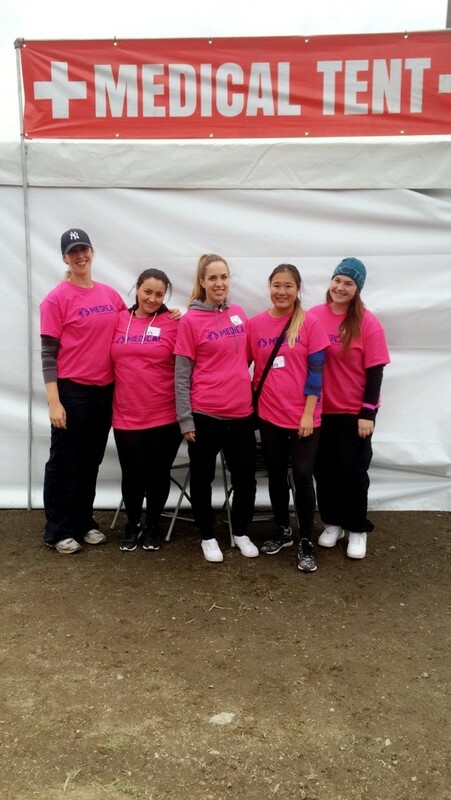 Douglas College Psychiatric Nursing (PNUR) students got their hands dirty at Whistler’s Mudderella event this September. Melissa Krol and Nicole LeMessurier volunteered at the 11-km obstacle course and race held at Blackcomb Mountain Sept. 24 to gain hands-on experience in the field. “Our responsibilities were to triage any patients coming into the medical tent. We used our assessment skills and relayed the collateral to the physician or nurse practitioner. In some minor cases, we were able to provide interventions, such as applying heat, wrapping limbs in tensor bandages and providing wound care,” Krol, a second-year student, said. LeMessurier, who has also volunteered at Ironman 5150, the Wayhome Music Festival in Ontario and the Rock ‘n’ Roll Marathon in Vancouver, said volunteers were taught to watch for signs of exercise-induced collapse. “We were there to remind and encourage the racers to keep their legs moving when their natural instincts were to stop and drop. This helped prevent them from collapsing due to blood pooling in their legs,” the fourth-year student said. Both PNUR students said the opportunity to volunteer at such a unique event allowed them to utilize their skills in a high-stress situation. “These events place you in an intense situation where you have to apply critical-thinking skills,” Krol said. LeMessurier thrived under the pressure and stress of Mudderella. Both women have a passion for helping others and a keen interest in mental health, leading them to psychiatric nursing as a career, and knowing the exceptional reputation of the PNUR program, Krol and LeMessurier made the decision to enroll at Douglas College. After graduating, Krol plans to work in acute psychiatry to gain experience and hone her skills before working in the community with Car 67 – a partnership between the Surrey RCMP and Fraser Health Authority pairing a clinical nurse specializing in mental health with a uniformed police officer. LeMessurier plans to apply to Fraser Health, focusing on adult acute psychiatry before moving towards a career in emergency psychiatric care.